Autumn has arrived but you would never believe it in Cyprus as the weather still remains pleasant and warm. In fact, it is the perfect time of year to enjoy the outdoors, and Larnaka has plenty of options from its beautiful beaches to the wonderful historical sites... all just waiting to be explored. Be on the look-out too for Larnaka's newest mascot in the form of a flamingo... Read on to find out more about the flamingo and everything else happening this season! One of Larnaka‘s defining landmarks - the Medieval Castle - is now available for corporate events... with a difference. With the kind permission of the Director of Antiquities the Castle has recently been made available for private corporate functions such as meetings, conferences, seminars and business cocktail parties. Larnaka is a unique tourist destination. We are pleased that so many holidaymakers recognise this fact and choose Larnaka as their number one destination year after year... after year! As a token of appreciation, Larnaka would like to give something back by rewarding repeat visitors via a new loyalty scheme. A new and improved transport system is now in place in Larnaka with the operation of new bus routes. 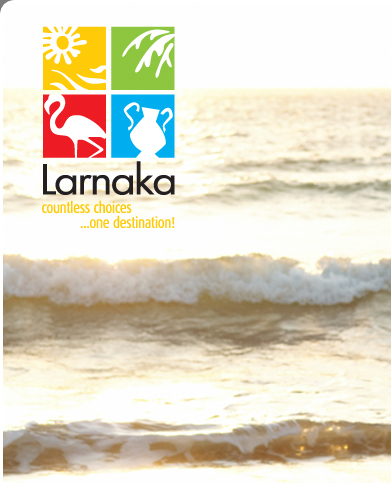 With a full-day ticket of only €2 why not catch a bus to an area of Larnaka you have not seen before? With so many villages on the routes you will get to see a different side of the region. The Larnaka-Dekeleia Road has been undergoing roadworks in order to improve and facilitate the link between this main tourist area and the town’s centre. The recent completion of Phase A means that more than half of the road has now been improved and modernised. Phase B had already been completed and Phases C and D are in the preliminary planning stages. A clay urn containing over 100-year-old Commandaria wine has been discovered in an old, traditional Cypriot mansion in the Larnaka village of Kornos. The wine was found in one of many clay urns stored in the house, which were discovered by contractors whilst they were renovating the house to make it into a museum with workshops. A mid-4th century BC commercial ship has been found in the area of Mazotos village, about 2.5 kilometres from the shore at a depth of 45 metres. A team of archaeologists recovered amphorae from the 2,350-year-old shipwreck named ‘The Mazotos Shipwreck’ which are now at the Larnaka Museum for conservation works. The last leg of the ‘EPA Senior Bowling Tour 2010’ tournament will be held at Rock ’n’ Bowl Bowling Centre in Larnaka from November 3 - 7, 2010. This is the fifth year the tournament visits the island and it is the only competition of its kind in Cyprus. Larnaka has a new friendly mascot in the form of a flamingo cut-out who is here to bring some fun to the photographs of locals and holidaymakers alike. The flamingo is now moving to his new, permanent home of the Larnaka promenade where he will be waiting patiently to have his photo taken with you.